How Much Does Your Car Cost In England? That old Lexus wagon right there? That’s my car. It’s a 2002 Lexus IS300 Sportcross. When I bought it last year it had the all-clear from a Lexus dealership, and roughly 73,000 miles on it. I paid (not to brag) $10,250 for it, which was roughly market rate. A very similar car just sold in England for £500. This is a 2002 Lexus IS200 Sportcross, just sold in England for the princely sum of £500. 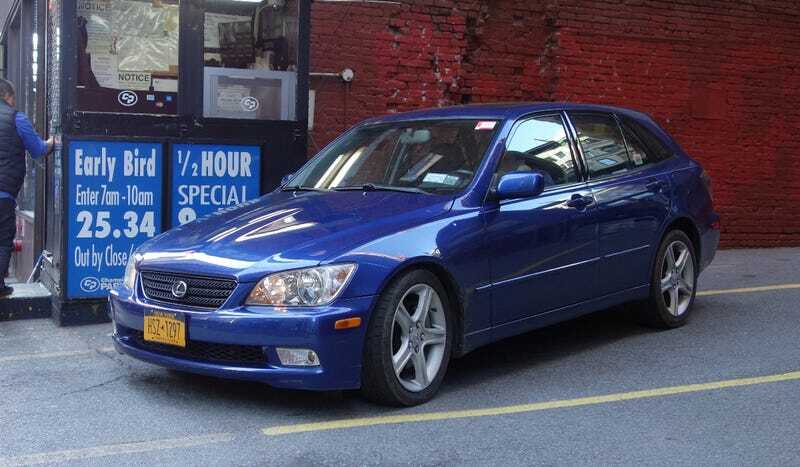 It was sold to Autoblog contributor Antti Kautonen’s brother, and I will admit it is not entirely identical to my own Lexus. It’s got the 2.0-liter “1G-FE” straight-six engine in it, good for 153 horsepower and 144 pound-feet of torque, as opposed to the 3.0-liter 217 hp 218 lb-ft “2JZ-GE” engine in my American Lexus. It’s also got a six-speed manual, as opposed to the five-speed automatic transmission in my car (a manual was never offered in the Sportcross in the States, presumably because the pure joy of my car with its big six engine and wagon-y back a six-speed manual would bring so much money on Bring A Trailer that it would collapse entire national economies). It’s also got navigation, whereas my does not, and smaller 16-inch wheels, as opposed to the 17s on my car. But other than that, they’re roughly identical. They’re even the same color. Oh, it’s also got 96,000 miles on it, a little over 20,000 more than what came on mine when I bought it. I had to look up how much £500 is in Freedom Dollars, since I’m not a brain-genius like you. I knew there was some sort of “exchange rate” going on, so surely £500 was equivalent to $10,250, right? I mean, they’re basically identical. So how on Earth was my car worth 1,500 percent more here in the States? It can’t just be an extra liter of displacement in the engine and an extra inch on the wheels. It had me wondering if the U.K. is just some sort of magical fantasy land, full of brown beer and the BBC and curry and wonderfully cheap used cars. Antti, a Finn, said that it was. By way of example beyond the Lexus, he pointed out that a friend of his recently bought a V8 Jaguar S-Type with a gearbox fault for a single, solitary British pound (yes, only £1). The gearbox fault cleared right up with new ABS sensors, he said. But as I mentioned before, Antti is a Finn, in Finland. Everything is expensive in Finland. Maybe everything is just cheap in the U.K. by comparison. So I went to ask a Brit in Britain. I showed him my Lexus up top, compared with the British cheap-o Lexus. “Oh my. That’s a biiiiiig difference,” he replied. Thinking it was maybe a one-off random pricing error, he went to check the price for Lexus IS wagons being sold across the United Kingdom. To his shock, there were only three listed on Autotrader for the whole country. The highest asking price was only £1,985, or about $2,550. In comparison, here’s an IS300 Sportcross for sale in the States right now, asking nearly $10,000, for a car with 101,000 miles, plasti-dipped wheels, and some dings and scrapes. Alex thinks that the rock-bottom prices in the U.K. are Lexus-exclusive, however. “What this could be (I’m not expert, mind), is that Lexus historically hasn’t been huge over here. At all,” he said. So to find out, let’s do a little crowdsourcing work. Do you own a car that’s five years old or more? Is there a rough equivalent for sale in the U.K.? What’s the price difference? We’re going to find out if this whole “United Kingdom” thing is all it’s cracked up to be.